Imani Winds Foundation exists to create meaningful connections through music. Winner of the prestigious Avery Fisher Career Grant and Sphinx Medal of Excellence, McGill is a leading soloist, recitalist, and chamber and orchestral musician. Now principal flute of the Seattle Symphony, McGill previously served as principal flute of the Dallas Symphony, San Diego Symphony, Florida Orchestra and Santa Fe Opera Orchestra. He recently served as acting principal flute of the Metropolitan Opera Orchestra and earlier with the Pittsburgh Symphony Orchestra. Proof of Love, the world premiere play by Audible-commissioned playwright Chisa Hutchinson (Surely Goodness and Mercy), directed by Jade King Carroll (The Gin Game), and starring Brenda Pressley (The Lyons, Almost Home, Seven Guitars), is now in rehearsals ahead of performances beginning Tuesday, May 7 at the Minetta Lane Theatre (18 Minetta Lane, between MacDougal & 6th Avenue – one block south of W. 3rd Street), Audible’s creative home for live performances in New York. Proof of Love, which will open on Tuesday, May 14, is produced by Audible Inc., the world’s largest seller and producer of downloadable audiobooks and other spoken-word entertainment, in association with New York Theatre Workshop. The play is the inaugural live production from Audible’s Emerging Playwright program, a dedicated $5M fund that enables the creation of original plays driven by language and voice, keeping with Audible’s core commitment to elevating listening experiences through powerful performances and extraordinary storytelling. Twenty-five commissions have already been announced, with new playwrights identified on an annual basis. Constance thought she had a happy life and a loving husband. Suddenly, a tragic accident splinters her upper-class black family—and forces Constance to face uncomfortable truths about her marriage and herself. Proof of Love is the explosive, funny, and moving new one-woman play by Chisa Hutchinson, member of the first class of talent supported by the Audible Playwrights Fund; Jade King Carroll directs. 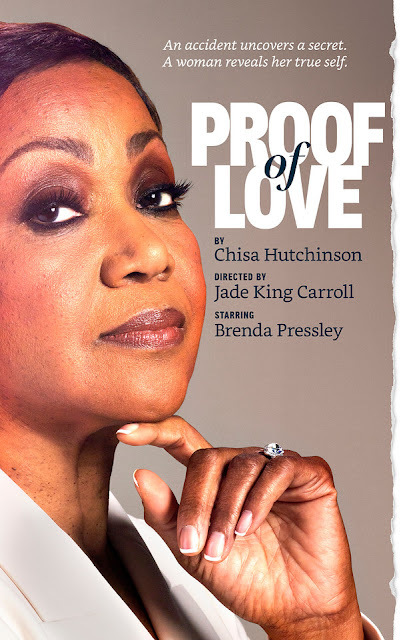 Proof of Love’s creative team includes Alexis Distler (scenic design), Jen Caprio (costume design), Mary Louise Geiger (lighting design), Justin Ellington (sound design), and Nikiya Mathis (hair and wig design). As with previous Audible Theater shows at the Minetta Lane, Audible will also record and release Proof of Love as an audio play, extending its reach to millions of listeners around the world. Award-winning and critically acclaimed Audible performances of captivating stage productions starring Billy Crudup, Judith Light, Aasif Mandvi, John Lithgow, Carey Mulligan, and others are available for download at www.audible.com/theater. Additional events at the Minetta Lane Theatre will be announced soon, and Audible has also announced live performances in London. Information about previous and future live programming produced by Audible is available here. With a 30-day membership trial at Audible, new listeners can enjoy any one audiobook, including the audio performances of productions at the Minetta Lane Theatre, free. Tickets are available at www.audible.com/minettalane, by calling Ticketmaster at 1-800-982-2787, and in-person at the Minetta Lane Theatre box office (18 Minetta Lane, between MacDougal & 6th Avenue – one block south of W. 3rd Street). For current box office hours, please visit www.minettalanenyc.com. Proof of Love will play Tuesdays and Thursdays at 7PM; Wednesdays, Fridays, and Saturdays at 8PM; Wednesdays and Saturdays at 2PM; and Sundays at 3PM. Audible, Inc., an Amazon.com, Inc. subsidiary (NASDAQ:AMZN), is the leading provider of premium digital spoken audio content, offering customers a new way to enhance and enrich their lives every day. Audible was created to unleash the emotive music in language and the habituating power and utility of verbal expression. Audible content includes more than 475,000 audio programs from leading audiobook publishers, broadcasters, entertainers, magazine and newspaper publishers, and business information providers. Berkeley Symphony Orchestra today named Joseph Young music director, beginning with the 2019–2020 season, for a three-year term. He succeeds the intendancy of Kent Nagano (1978-2008) and Joana Carneiro (2009–2018). Three months ago, when a conductor who was to substitute for Carneiro canceled, Young came to the rescue and conducted Berkeley Symphony on a 48-hour notice, in a challenging program of a world premiere, Bernstein’s Symphony No. 2, and Britten’s Four Sea Interludes from Peter Grimes. “Why don’t you come study with me?” she replied. The timing was perfect, as Alsop was in the process of developing a fellowship between the Peabody Conservatory and the Baltimore Symphony Orchestra. Young would become the first-ever BSO-Peabody conducting fellow. Alsop would continue to be what Young refers to as one of his most supportive and impactful mentors. Currently, Young is the Ruth Blaustein Rosenberg artistic director of ensembles at the Peabody Conservatory and resident conductor of the National Youth Orchestra (USA). From 2014 to 2017, he served as the assistant conductor of the Atlanta Symphony, where he conducted more than 50 concerts per season. 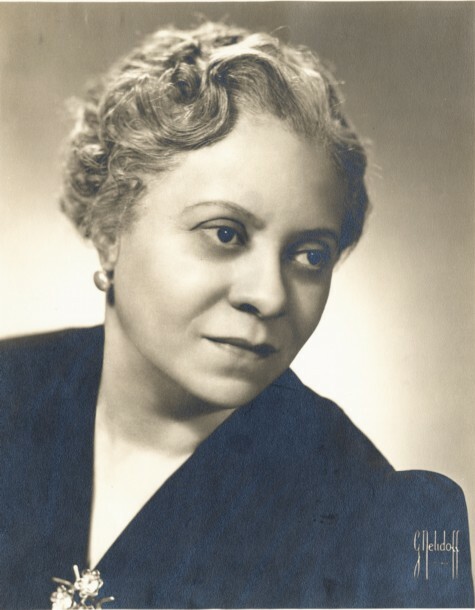 Young also served as the music director of the Atlanta Symphony Youth Orchestra, resident conductor of the Phoenix Symphony, and the League of American Orchestras conducting fellow with Buffalo Philharmonic and Baltimore Symphony. 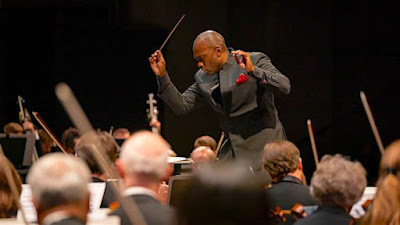 As guest conductor, Young has led the Saint Louis Symphony, Buffalo Philharmonic, Colorado Symphony, Detroit Symphony, Phoenix Symphony, Bamberger Symphoniker, New World Symphony Orchestra, Spoleto Festival Orchestra, Orquestra Sinfónica do Porto Casa da Música, and the Orquesta Sinfonica y Coro de RTVE (Madrid), among others. Pivot Arts, which celebrates innovative, multidisciplinary performance, has expanded the lineup for its seventh annual Pivot Arts Festival, including five world premieres by playwright/director Seth Bockley, BraveSoul Movement, Chicago Fringe Opera, choreographers Ayako Kato and Erin Kilmurray, musician/actor Ahmed Moneka making his U.S. debut and more. The Festival runs May 31–June 9 at various locations in Chicago’s Uptown and Edgewater neighborhoods. A Festival Preview Party fundraiser takes place May 22 at 6 p.m. at Francesca’s Bryn Mawr, 1039 W. Bryn Mawr Avenue. Festival artists join Pivot Arts board members and supporters for Italian cuisine, drinks and entertainment, supporting the Festival through tickets and a silent auction. The party also features the first-ever Pivot Arts Awards: the Award for Artistic Contribution, to playwright and artistic associate Isaac Gomez, and the Award for Community Contribution, to Francesca’s Bryn Mawr, which has supported Pivot Arts with significant in-kind contributions since 2014. Tickets are $55 in advance at pivotarts.org/project/festival-preview-party-2 or $60 at the door. Jenni Lamb and Ethan Parcell, June 5 at 7:30 p.m., Loyola University Chicago’s Mundelein Center for the Arts, 1020 W. Sheridan Road. Lamb’s play Jumble of Bones uses movement and puppetry to tell the story of a friendship between a therapist-in-training and her client, exploring the ways we are all bound together on this planet. Parcell’s A Pleasant Come-Across, or A Dozen-or-so New Rags is a collection of new revisionist ragtime compositions, performed by an instrumental ensemble with a cartoonish commitment to silent-film slapstick and circus antics. Tickets are $10, $5 with student ID. Po’Chop/Jenn Freeman and Courtney Mackedanz, June 9 at 3 p.m., the Edge Off Broadway, 1133 W. Catalpa Avenue. 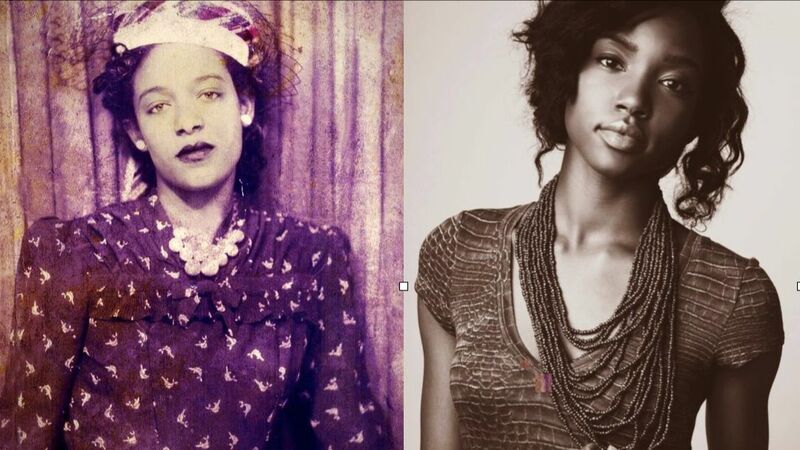 Po’Chop/Freeman’s The People’s Church of the Ghetto is a multidisciplinary (dance, poetry and music) project that creates spaces to learn, edify and worship the legacies of black women. Clusterfuq, a new performance art piece by choreographer Mackedanz, portrays a group of friends who discover they change one another’s blood types as they disclose their personal traumas. Tickets are $10, $5 with student ID. follows with updated information and ticket packages. Chicago Fringe Opera and BraveSoul Movement present The Rosina Project: May 31 at 7:30 p.m., June 1 at 8 p.m. and June 2 at 7:30 p.m., Alternatives, 4730 N. Sheridan Road. A contemporary adaptation of Rossini’s opera The Barber of Seville that mixes hip-hop MCs, opera singers and street-dance artists with a live DJ and beatboxer to perform an original story of female empowerment and interracial friendship as an immersive house party. Originally developed in the 2018 Pivot Arts Incubator Program at Loyola University. Tickets are $15. Art Union Humanscape presents “To the Shore: ETHOS Episode I” by Ayako Kato: June 1 at 11 a.m., June 2 at 1 p.m., Colvin House/Creative Co-Working, 5940 N. Sheridan Road, culminating at Thorndale Beach. This meditative performance combines dance, movement and music to illuminate the connection between everyday human gesture and wisdom from the past. Part one of a three-part project, ETHOS reflects upon how contemporary humans have evolved both spiritually and physically from ancient times. Tickets are $15. Brittany Harlin presents Don’t Forget Your Mother: June 6 at 8:30 p.m. and June 8 at 8 p.m., the Edge Theater, 5451 N. Broadway. Harlin’s choreographic memoir is dedicated to her mothers here on Earth and her ancestors beyond. 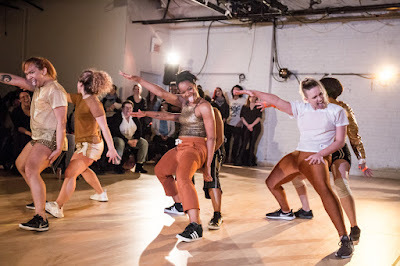 Using storytelling, poetry, song and dance, accompanied by a live band, the performance by four dancers and four musicians connects Harlin’s personal experience with trauma to pieces of African Diasporic culture, granting herself the heritage that threatens to be erased over time. Tickets are $15; a combined ticket for Don’t Forget Your Mother and Search Party on June 6 is $30. Search Party by Erin Kilmurray: June 6 at 7 p.m., June 8 at 9:30 p.m. and, closing the Festival, June 9 at 8 p.m. at the Edge Off Broadway, 1133 W. Catalpa Avenue. 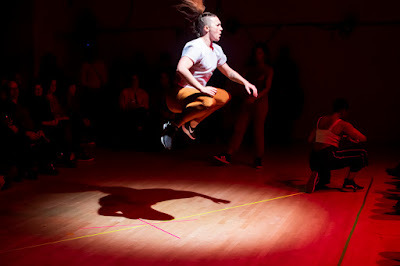 This live dance work by Kilmurray, creator of The Fly Honey Show, exists somewhere between a nightclub and a sports arena. Featuring a group of women, this performance relentlessly challenges and reconstructs the boundaries we face during this charged political moment by investigating agency, freedom and societal expectations. Tickets are $20, $15 with student ID; a combined ticket for Don’t Forget Your Mother and Search Party on June 6 is $30, and a combined ticket for Search Party and Gilgamesh and Enkidu on June 9 is $35. Girasol: An Evening of Latinx Performances curated and hosted by Isaac Gomez and Nancy Garcia Loza: June 7 at 9 p.m., the Edge Theater, 5451 N. Broadway. Girasol is a 90-minute cabaret-style event featuring comedy, poetry, music and more in celebration of the robust and pivotal work of Latinx artists in Chicago. The lineup to date includes comedian Melissa DuPrey; poets Davon Clark, Keren Diaz de Leon and José Olivarez; and storytellers Jasmin Cardenas, Wendy Mateo and Karari Olvera, with musicians to be finalized . Tickets are $15, $10 with student ID; a combined ticket for Girasol and Gilgamesh and Enkidu on June 8 is $30. 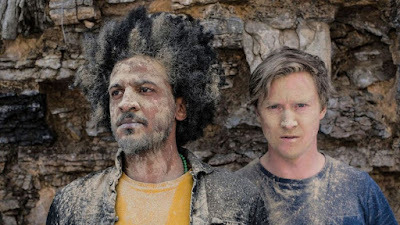 TRIA Theatre presents Gilgamesh and Enkidu by Ahmed Moneka (U.S. debut), Jesse LaVercombe and Seth Bockley: June 7 at 7 p.m., June 8 at 3 p.m. and June 9 at 6 p.m. at the Edge Off Broadway, 1133 W. Catalpa. A collaboration between Toronto-based musician/actor Ahmed Moneka, an internationally acclaimed artist from Canada, where he sought political asylum, and actor/writer Jesse LaVercombe with Chicago playwright and director Seth Bockley. This two-man epic reanimates the world’s oldest written narrative with maqam-style Iraqi music and 21st century biography, highlighting Moneka’s own exile from Baghdad. Gilgamesh and Enkidu fuses highly physical theatre, soul-filled musical expression, ancient text and intimate storytelling, illuminating the tale’s eternal mysteries of mortality and the universal balm of friendship. Tickets are $25, $15 with student ID; a combined ticket for Gilgamesh and Endiku and Girasol on June 8 is $30, and a combined ticket for Search Party and Gilgamesh and Enkidu on June 9 is $35. 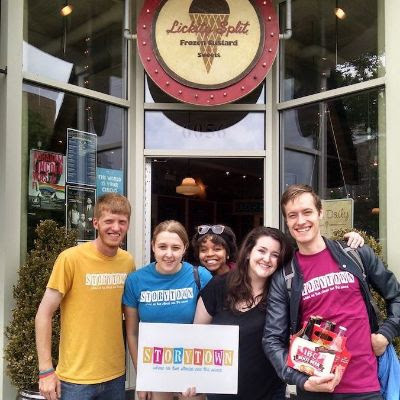 In a special event for families, Storytown Improv presents Ice Cream and Improv! (Well, Custard...) June 9 at 11 a.m. at Lickity Split Custard & Sweet Shop, 6056 N. Broadway, featuring an interactive kids’ improv show plus custard and sweets for purchase. Tickets are $10. Tickets for the 2019 Pivot Arts Festival are on sale now at pivotarts.org/festival. Pivot Arts, which produces and presents contemporary and multidisciplinary performance on Chicago’s far North Side, envisions a vibrant community where collaborations between artists, businesses and organizations lead to the support and creation of unique performance events. 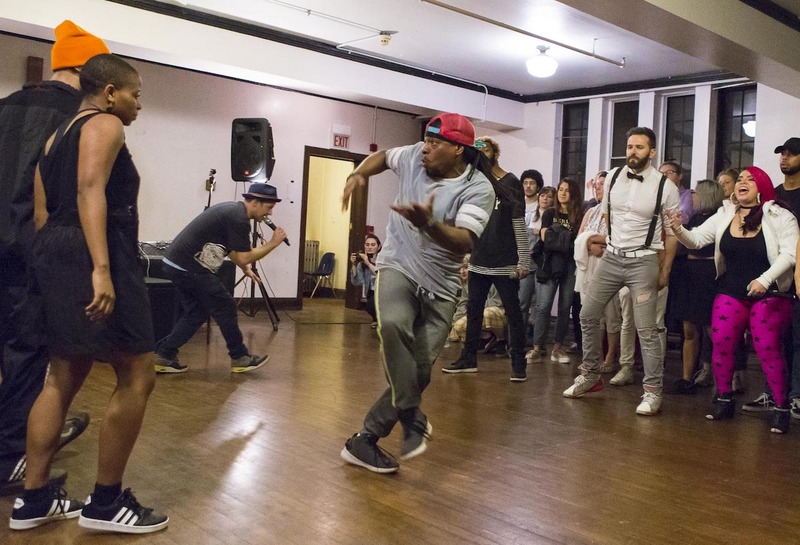 Pivot Arts supports multidisciplinary artists through its arts incubator program and fosters the creation of imaginative performance events. In addition to the Festival, Pivot Arts hosts a Live Talk series that includes performances and discussions and creates site-specific works throughout the year. Pivot Arts is funded in part by the Alphawood Foundation, FLATSstudio, Loyola University Chicago, the Illinois Arts Council, the MacArthur Funds for Arts and Culture at the Richard H. Driehaus Foundation. Gilgamesh and Enkidu was developed in partnership with Tarragon Theatre, Guthrie Theatre and the support of Canada Arts Council. Gilgamesh and Enkidu is supported by the Arts Midwest Touring Fund, a program of Arts Midwest funded by the National Endowment for the Arts, with additional contributions from the Illinois Arts Council and the Crane Group. The Afro-American Chamber Music Society Orchestra presents the Le Chevalier de St Georges Festival, Sunday, June 9th, 2019 from 3 to 6 pm featuring LA Philharmonic Violinist, Dale Breidenthal performing Concerto in G and Sonatas for Harpsichord & Violin; other performers include concerto competition winners Manoela Wunder and Nadira Kimberly, Violinists; and Professor Glen Grab, Cellist performing Symphonie Concertante in C. Tickets are $20 online at aacmso.brownpapertickets.com. Purchase your tickets today! Tickets at the door are $25. Make donations on our website by clicking the DONATE button at aacmsorchestra.org. For further information, please contact Professor Janise White, Founder & Conductor at aacmsorchestra@gmail.com. This May, the Metropolitan Youth Symphony illuminates the diversity of our nation's rich cultural tapestry with the program "America's Florence." "The opening movement... recalls Dvorák's New World Symphony, while the following slow movement features a moving hymn tune of Price's design. Both concluding movements are fast and return to the juba dance concept. They contain hints of fiddles and banjos, antic slide whistle effects, and a recurring three-against-two melody which end this loveable work on a whimsical note." Also on the program is Price's vivid and playful Dances in the Canebrakes, which suggests a cakewalk, a rag, and a hot and languid summer soiree, all among the sugarcane. Originally composed for piano, this suite is orchestrated by William Grant Still, widely regarded as "the Dean of African-American composers." The third installment of the Symposium of Art Music from the Caribbean was held April 4-6, 2019 at the Conservatorio de Música de Puerto Rico (CMPR) in San Juan, Puerto Rico. The CMPR hosted the event as part of its annual Symposium of Music Research, now in its fifth year. 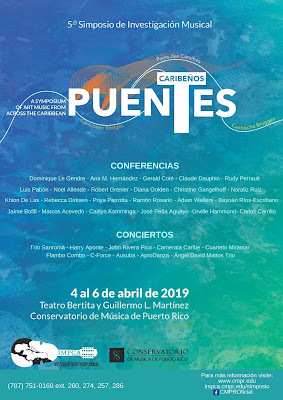 For this third Symposium of Art Music, the event adopted its new name, Puentes Caribeños (Caribbean Bridges). The goal of the event’s organizers and participants is to hold it, with its new name, bi-annually at alternating locations throughout the Caribbean. The Symposium began in 2013, conceived by Dr. Christine Gangelhoff from what was then the College of The Bahamas (now the University of The Bahamas), as the International Symposium on Composers of African and Afro-Caribbean Descent. 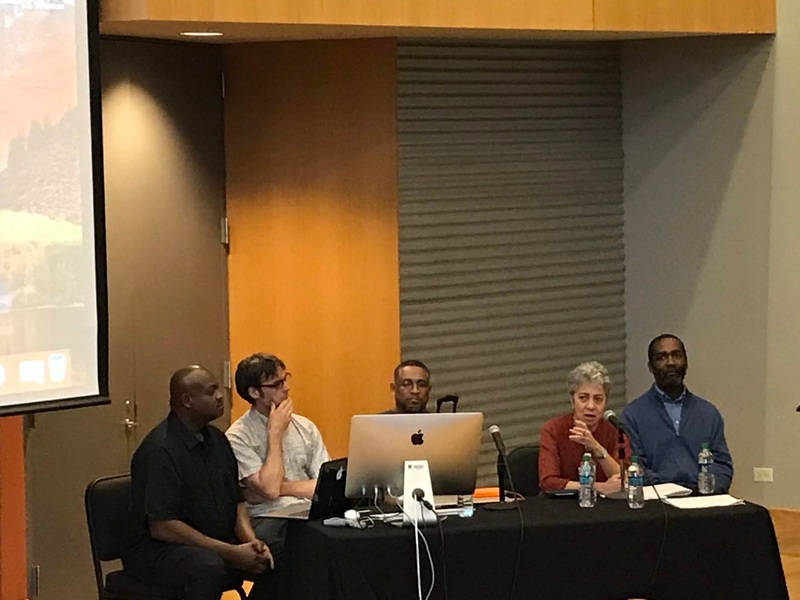 The Symposium brought together musicians, composers, scholars and students to engage with the topic of Caribbean art music. This symposium drew participants both local and international and was continued - with the same format and the same goals - in November 2014 at the University of Trinidad and Tobago (UTT), where it was organized by UTT’s music faculty member Dr. Adam Walters. The third Symposium was spearheaded by Dr. Carlos Carrillo (University of Illinois Urbana-Champaign), who was formerly on faculty at CMPR. 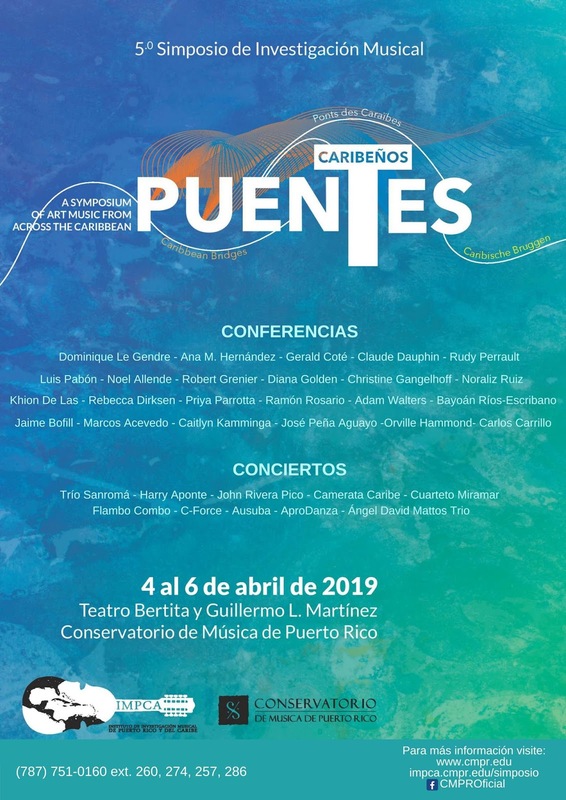 Puentes Caribeños (Caribbean Bridges), focused on strengthening bonds between composers, performers, artists, and scholars throughout the Caribbean and its diaspora, and with specialists from outside the region. The three-day event featured a mix of scholarly presentations and topical discussions as well as opportunities to network and hear performances of relevant musical works. Sessions included presentations of academic papers, talks by regional composers, and concerts. Performances included local traditional music from Puerto Rico and the Virgin Islands and pieces recently composed for the concert hall. The organizing committee was comprised of Jaime O. Bofill Calero (Conservatorio de Música de Puerto Rico), Carlos Carrillo, Christine Gangelhoff, Adam Walters. 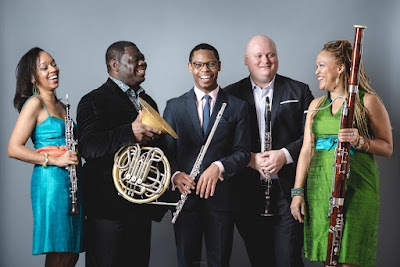 Concerts were offered by faculty musicians resident at CMPR and by featured visiting ensemble C Force, the faculty trio from the University of The Bahamas. The trio is comprised of Dr. Christine Gangelhoff (flute), Dr. Paul Jones (piano), and Mr. Christian Justilien (euphonium). 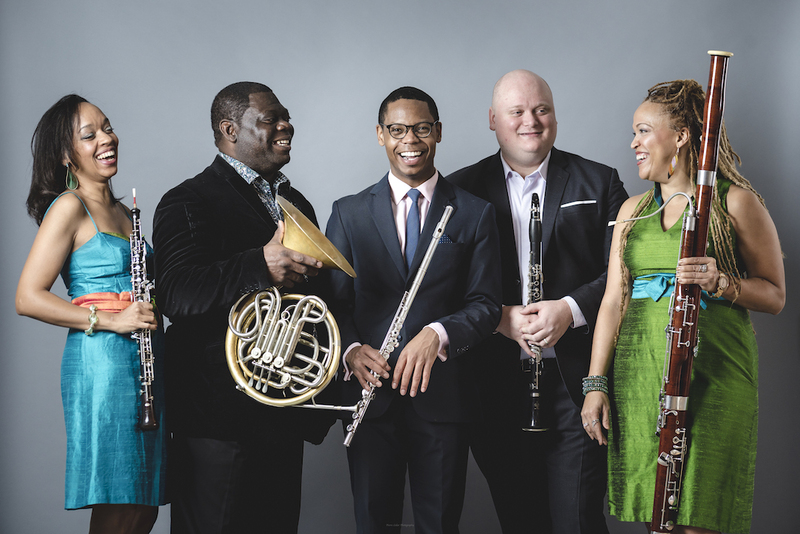 Since its formation in 2008 (with pianist Dr. Christy Lee), C Force has performed Caribbean art music in concerts throughout the region, including many of the family island of The Bahamas. 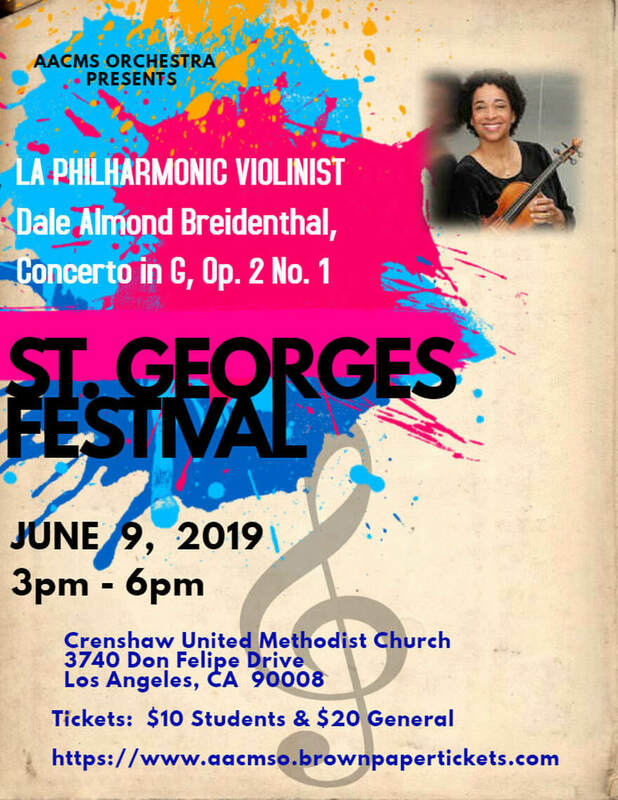 One goal of the trio is to showcase little-known classical composers of the Caribbean region in original compositions, transcriptions, and arrangements. The performance by C Force included several works composed specifically for members of the ensemble: Bahamas Island Suite, composed by trio member Christian Justilien, Sonate à Christine, composed for flutist Christine Gangelhoff by Haitian composer Julio Racine, and Where the sand meets the ocean, by Dr. Carlos Carrillo Cotto. The performance of Sonate à Christine was the premiere of all three movements of the work. Dr. Carrillo’s work was composed for C Force earlier this year, as part of his residency as International Visiting Scholar at the University of The Bahamas (UB). His residency and original composition were completed in conjunction with UB’s Colour of Harmony, a collaboration between the university’s visual art and music departments. 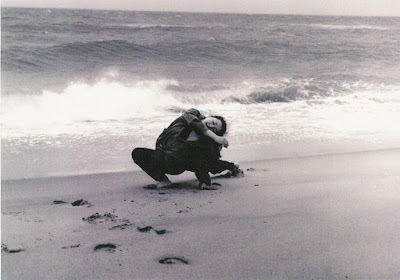 The theme of the event was the sea, which served as inspiration for the composer and artists. 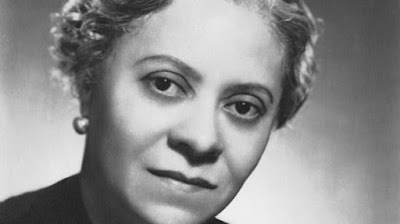 Dr. Carillo’s composition for C Force was performed on 22 March, 2019 and accompanied by the projection of artwork from prominent Bahamian artist, Lilian Blades. The premiere of the complete work took place at Puentes Caribenos, with Dr. Adam Walters on horn and conch shell joining C Force in the opening welcome concert for the Symposium. Other performances of particular note included Sept Pièces Créoles, composed by Alain Pierre Pradel of Guadeloupe, performed by renowned Puerto Rican pianist Harry Aponte, and Songs of the Islands by Trinidadian composer and keynote speaker Dominique Le Gendre, sung by vocal students at CMPR. 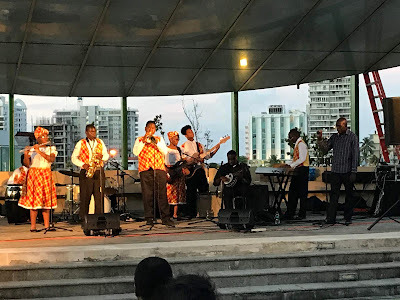 The Symposium was capped by an outdoor evening concert by Flambo Combo, a student ensemble from Bertha C. Boschulte Middle School in St. Thomas. 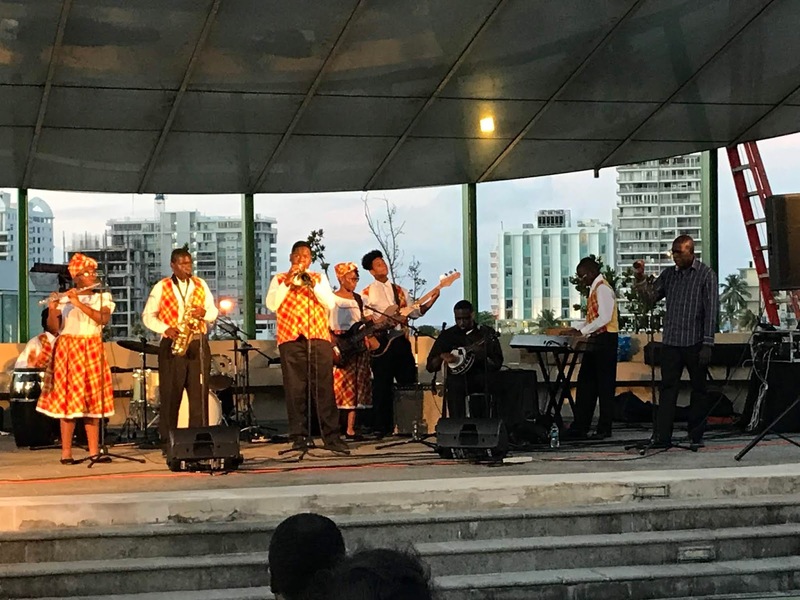 Flambo Combo specializes in quelbe, the local traditional music from the Virgin Islands. The concert ended in a jam session, with several of the participating musicians and composers joining Flambo Combo onstage. IMI Artists: Concert reviews and photos to enjoy!